We stood on the edge of the cliff, eyes firmly locked on the horizon. The bright orange sun slowly descended, as it blanketed the sky with an orange hue, followed by a gradient of deep blue, pink and purple. Finally, the valley turned dark and the moon shone bright. It was the most magical sunset I’ve ever seen. I haven’t seen an aurora borealis, but this felt as unreal to me. The only thing that broke the spell? The dozens of tour groups standing beside me. 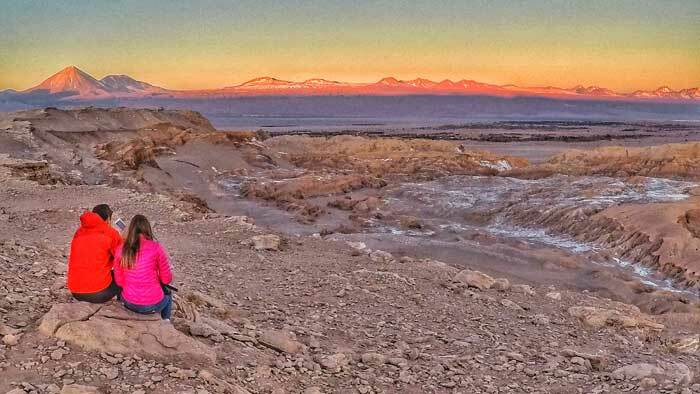 And there are HUNDREDS of tour operators in San Pedro de Atacama, all providing the popular Valle de la Luna (Valley of the Moon) tour which ends with the sunset at the Piedra del Coyote viewpoint. 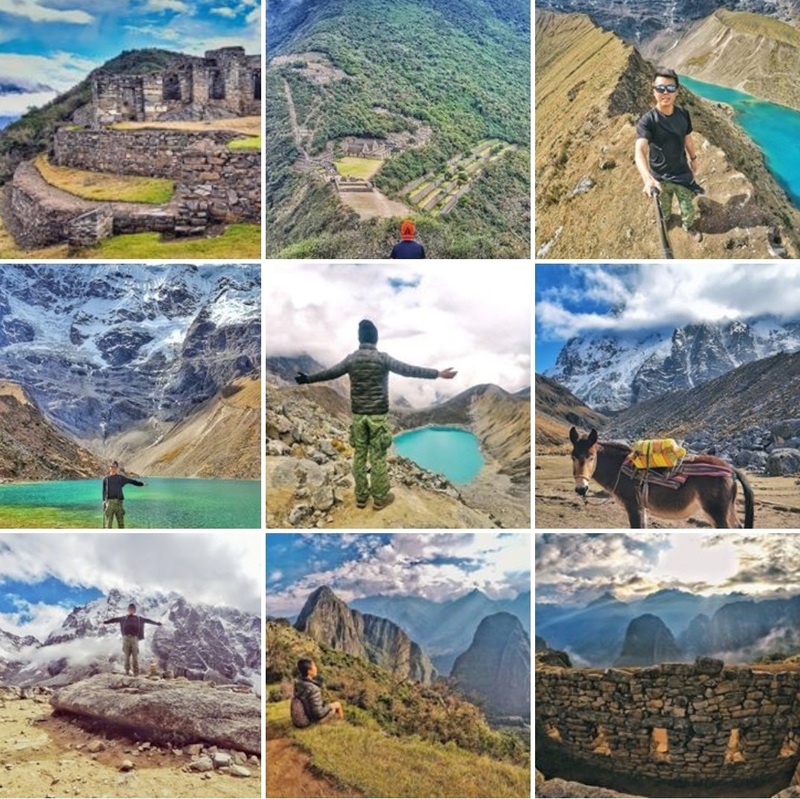 Almost every tour operator follows the same route, but mine is different. 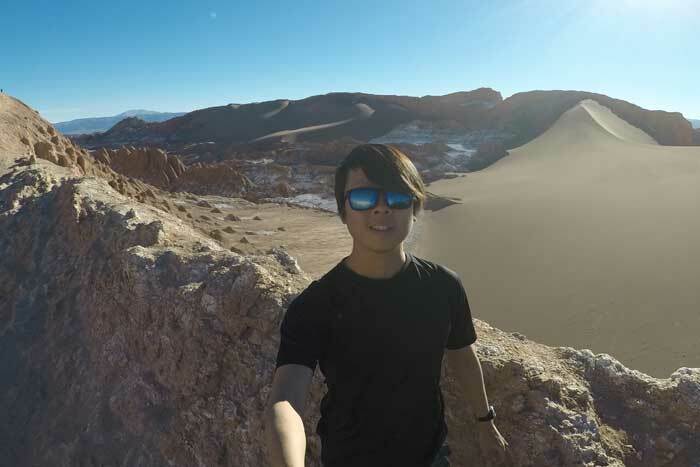 We started with a hostel pick-up in a red car/van hybrid at 3pm, and our bilingual guide Gustavo drove us to the entrance of Valle de la Luna just 10km from town to pay for our entrance tickets. 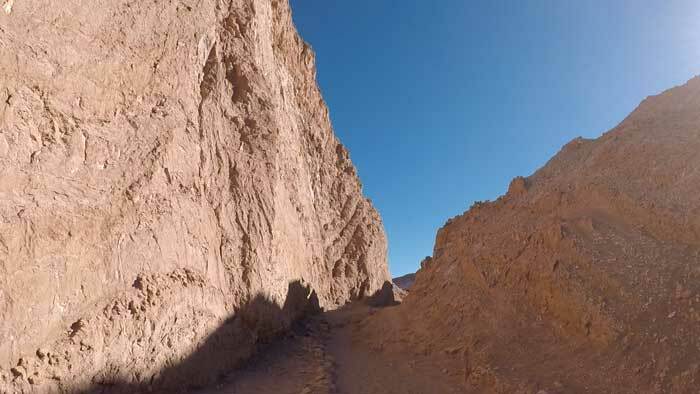 Our first stop had us walking under the unforgiving sun, amongst canyons made of red minerals, climbing up to a viewpoint of the valley. To the right are huge undulating sand dunes that look so smooth they’re perfect for sandboarding. It’s a pity the area is cordoned off, otherwise I’d be rolling in the deep sand like a little kid seeing snow for the first time. To the left are sand and stone formations - moulded by millennia of wind and water – jutting out from the ground like spikes on the back of a dinosaur, presenting a look akin to the surface of the moon. It is easy to understand where the name of the valley comes from. To the back of the desert are towering snow-capped volcanos and mountains of the Andes watching the townsfolks of San Pedro. 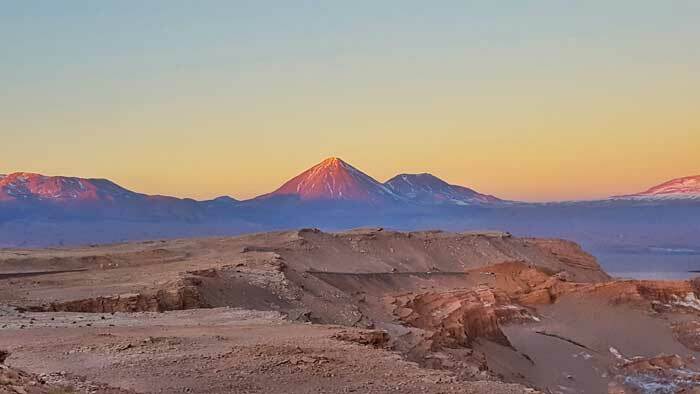 The tallest and most famous of them all is Volcan Licancabur (in the native tongue – Mountain of the People), regarded as a holy mountain to the Atacamenos. This breath-taking scenery is sadly ruined by the hundreds of people all there at the same time. Before a huge tour bus of people arrived, I was glad we quickly made our way to our second stop. “Look, the moon!” Gustavo pointed in the distance. There it was, the faint outline of the moon at 4pm. The sun was still shining bright in the desert sky. All around us the ground was covered in white. But it wasn’t snow (even though it was winter). It was salt. Rocks covered with salt. Sand covered with salt. Walls covered with salt. Walls – from the abandoned Victoria Salt Mine. These salt particles coagulated to form their own salt crystals and when seen from far, looked like freshly melted snow. 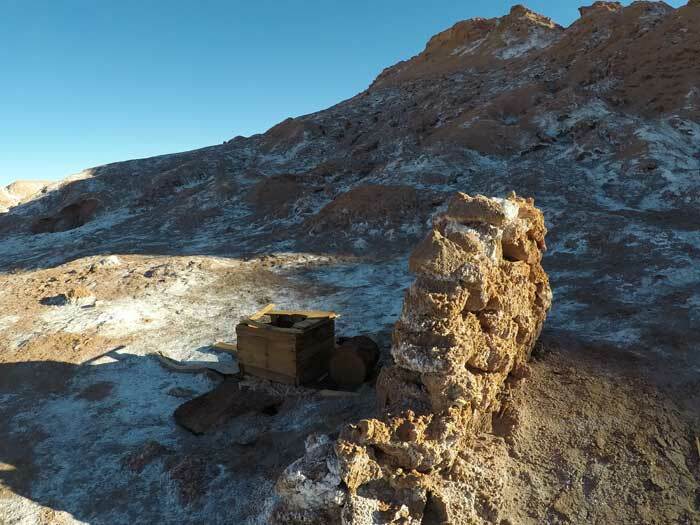 Here we see bricks made entirely with salt, a brief introduction to the salt hostel I would later stay at in Uyuni. We did not go into the actual mine, just around it. Not much information is known about these mines, neither can they be found on the internet. 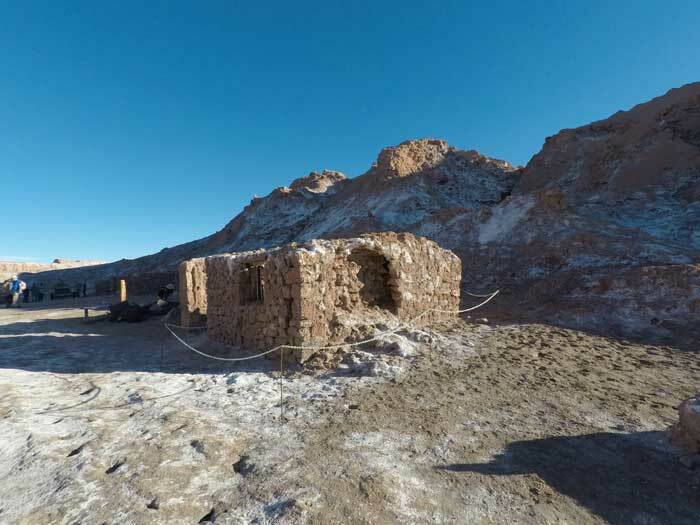 But what we knew was that one of the largest open pit mines in the world – the Escondida Copper Mine - is not far away in the Atacama Desert. 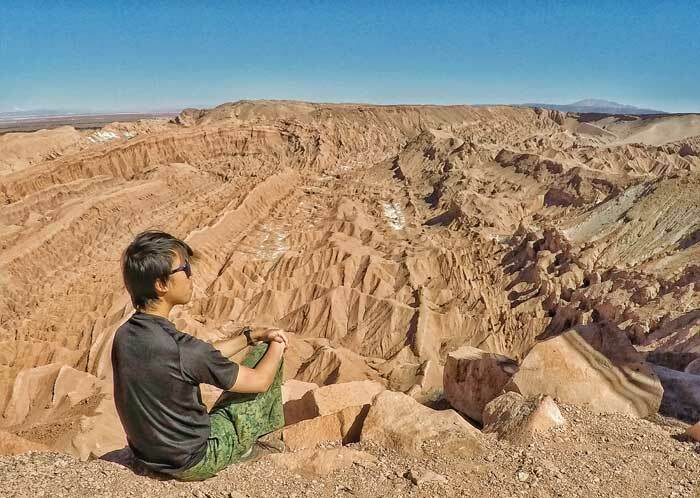 The third stop in the tour was to visit the Amfiteatro, a huge red-brown rock protruding from the earth with wavy striations, similar to the Talampaya Canyons in Argentina. I asked Gustavo if it acts as a natural amphitheatre – with the echo and acoustic and all. Nope, he said, just the shape. What a disappointment. But for a piece of rock to be an attraction on its own, a job well done. 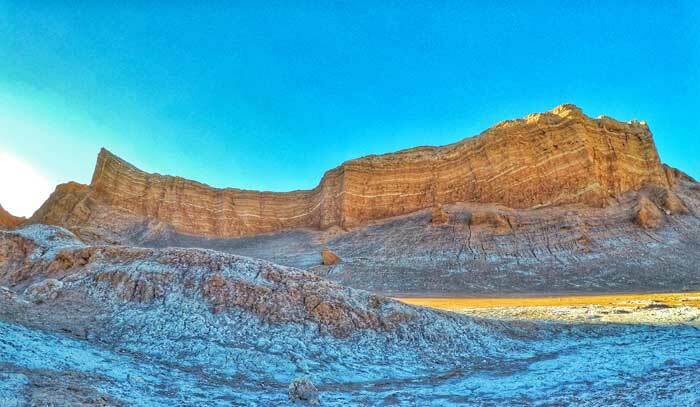 The Valle de la Muerte (Death Valley) used to be part of the Valle de la Luna tour. In recent years, due to price increases in entrance fees, they were separated and each became their own tour. However, my tour group made a special request and the helpful Gustavo made a detour to the Death Valley. The ticket counter is a small hut at the corner, which honestly, can be avoided. 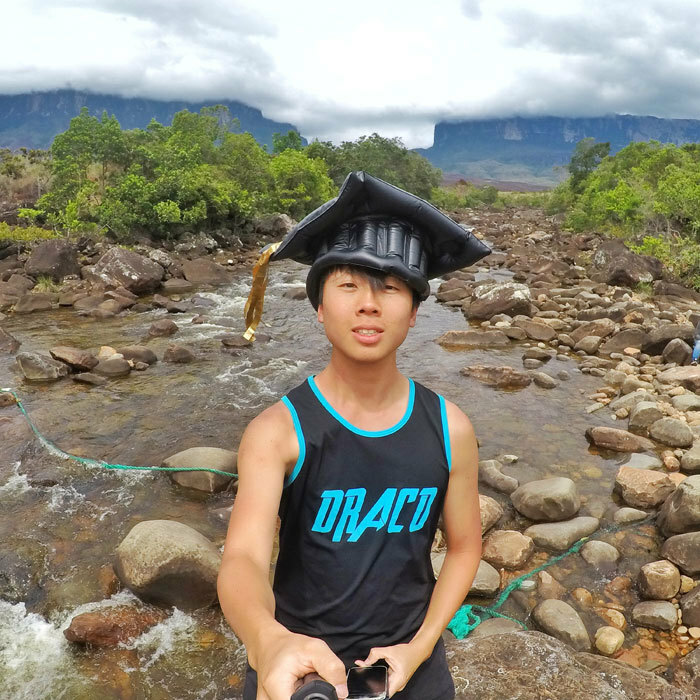 I paid CLP $1000 to enjoy the majestic valley. 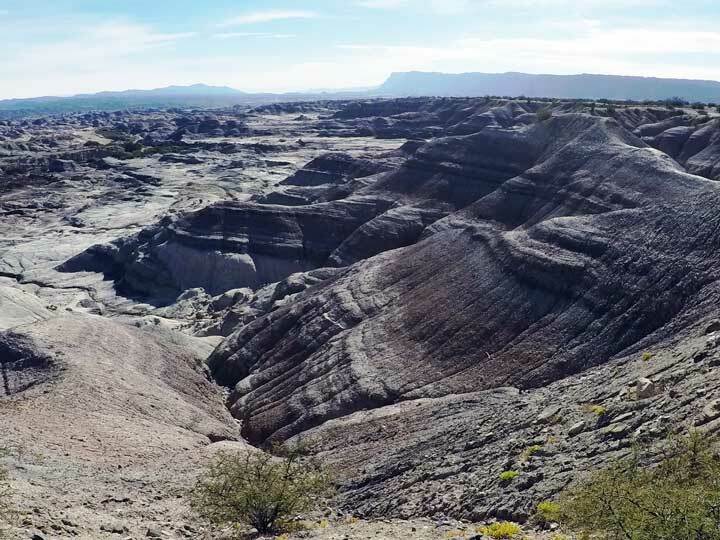 The terrain seemed even more extra-terrestrial than the Moon Valley. Mounds of little undulating hills spread endlessly across the valley, giving a sense of how desolate and deserted this area is. Unfit for life – hence the name Death Valley. Nevertheless, the new name is fitting for this arid desert, the driest on earth. By this time, the moon rose fully. The sun began to set. We rushed to the viewpoint back in the Moon Valley for the most gorgeous sunset of my life. 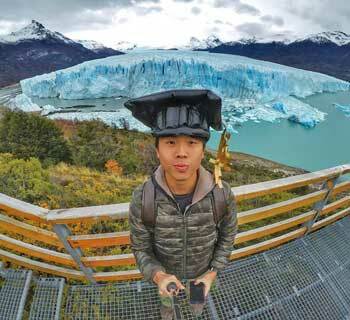 Even though it was bombarded by tourists, everyone became silent for a moment; as the colourful gradient slowly turned black, as the snow-capped volcanoes in the background changed colours, as the afternoon heat turned into evening cold. We just stared at the horizon. It was a perfect ending to the tour. 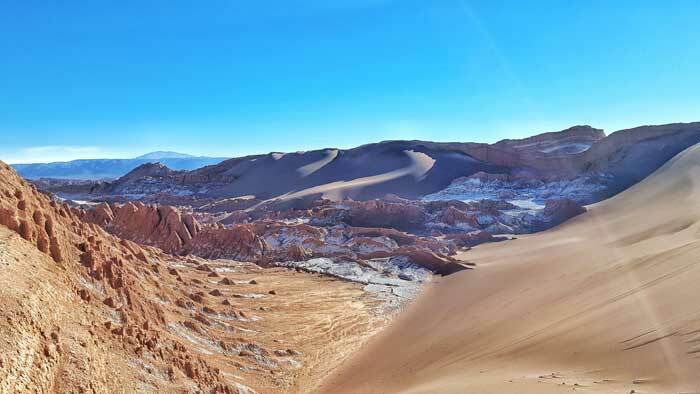 The Valle de la Luna in San Pedro de Atacama, Chile, although otherworldly, isn’t impressive to me. 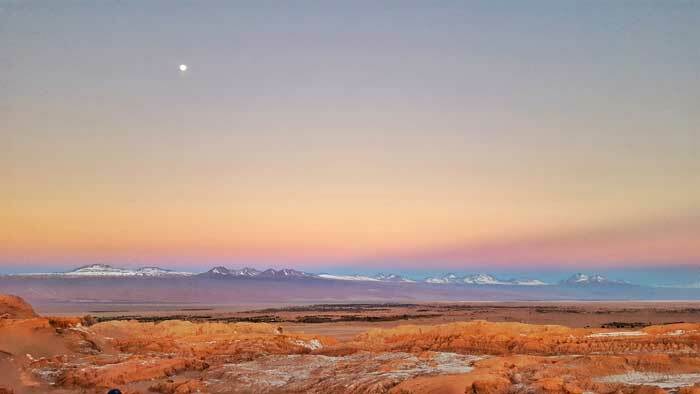 I’ve been to another Moon Valley in Argentina and that set the standard too high. Till date, it is the most underrated attraction I’ve visited. One is grey, one is brown. They look totally different but both are thought to be representations of the moon. Who gets to decide how the moon looks like? Until space tourism is a thing, I guess any place that looks out of this world can be called the Valley of the Moon. I booked the tour through my hostel in San Pedro: Chill Hostel, at CLP $10000. In turn, they booked through Maxim Tours. The differences with other tours are the visits to Victoria Salt Mine and the Death Valley, without the more common Cuevas de Sal (Salt Caves) most tours go on. So, if you want a slightly different experience as others, give them a try!